It is the organ of hearing and plays an essential job in preserving the balance (equilibrium) of the body. The ear is split into 3 parts, viz. The internal ear is composed of bony labyrinth, a complex space, also in the petrous part of the temporal bone comprising fluidfilled up membranous labyrinth. The membranous labyrinth includes sensory receptors for hearing and balancing. The middle ear or tympanic cavity is a small air filled space inside the petrous part of the temporal bone comprising the auditory ossicles. It interacts with the nasopharynx via auditory tube. 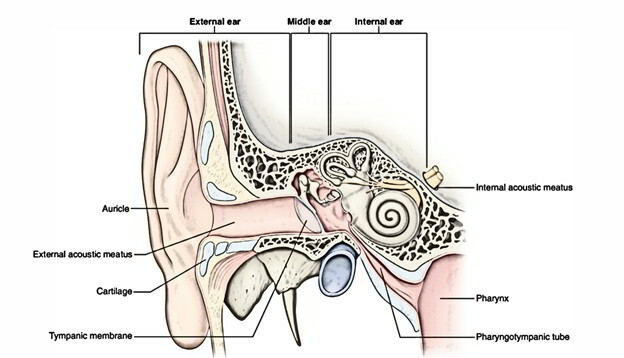 By its medial wall, the middle ear adjoins the internal ear.The external ear is composed of the auricle or pinna and external auditory meatus in the medial end of which the tympanic membrane or ear drum is located, dividing the external ear from the middle ear. The sensations of hearing and balancing from these receptors are carried by vestibulocochlear nerve to the cerebral cortex for interpretation.